world a mustache. So that's the project. up the camera and get ready for compliments. Don't have an iPhone? 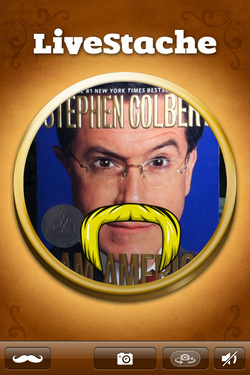 on and help me reach my goal of sharing mustaches with the world. Oh one more thing, I should thank all the people that helped. Drew Taylor did an amazing job on the graphics. Laura Palmer and I co-wrote the script for that video, which Paul Sobota filmed and edited with background music by Matt Fitzpatrick. The people in the video are Molly Walker, Julie Patton, Yaya Zhang (who also prepared delicious food for the filming) Raissa Batieno, Noah Hrbek (also featured as our food sculptor) Josh Ehrlich, Unknown Grandma from iStockPhoto, Kailie Charnas-Nelson (thanks to mother Alex Charnas and father Brian Nelson), Drew Ratcliff (who was helpful all around the board), Abraham Lincoln, and Arcey Harton.